[Editor’s Note, 1997: In every developing community, certain structures epitomize detail and design during periods of that development. Staff of the North Carolina Department of Cultural Resources, as well as many of the Federal Point Historic Preservation Society members, felt that Joy Lee Apartments on Carolina Beach Avenue, North at Carolina Beach represented a period of growth in the 1940s that has lasted throughout the last 50 years and is still flesh and useful. For this reason, Beth Keane graciously volunteered her time and in nominating the beautiful resort attraction to the National Register of Historic Places. As of this writing (early April, 1996), the nomination has passed the local and State level of significance and is being reviewed for national significance. Many thanks to Beth for her contribution to the Federal Point community]. Grover Lewis, a masonry construction worker, together with his family, moved to Carolina Beach from High Point, North Carolina, in March, 1941. Mr. Lewis went to work for the North Carolina Shipbuilding Company and moved his family into the Marianette Cottage on Carolina Avenue, North. When the lot next door was filled in by a storm in the fall of 1944, the Lewis’s decided to purchase it. Mr. Lewis immediately began designing the Joy Lee Apartment Building. Long shipyard hours made it necessary for Mr. Lewis to hire William Bordeaux to build the basic concrete block structure. After purchasing a hand-operated cement block press, the Lewis family turned out two blocks at a time, approximately fifty per evening. 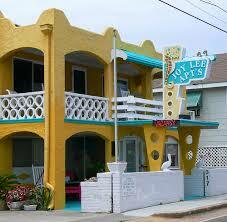 Named the Joy Lee Apartments after Mr. Lewis’s daughter, the completed duplex was rented to vacationers. Each apartment consisted of a living room, a dining room, a kitchen with an ice box, two bedrooms, each with a closet, and a central hall. Considered luxury units at the time, they came equipped with private porches and private baths with hot and cold running water. After the war, Mr. Lewis returned to masonry construction work. For the next ten years, Mrs. Lewis ran a large rooming-house, as well as the Joy Lee Apartment Complex. The growth of Carolina Beach doubled during this time period; by 1950, there was a year-round population of 1,080. Due to the popularity of the Joy Lee Apartment Building as a vacation destination, the Annex was constructed in 1948. While similar in form and structure to the original building, stylistically it exhibits design elements reminiscent of Frank Lloyd Wright’s prairie style. Carolina Beach experienced widespread devastation several times during the past 50 years. Hurricane Hazel roared ashore with 150 miles per hour winds on October 15, 1954. Hurricane Diana struck in 1984 and last but not least, Hurricanes Bertha and Fran in 1996. Suffering only minor water damage and some roof damage, the solid masonry construction allowed the Joy Lee Apartment Building to weather these storms intact. The Joy Lee Apartment Building and Annex are a unique combination of several popular architectural styles, including Mission Style, Art Deco, Art Moderne, as well as the Prairie Style. After the 1940 fire which destroyed many of the frame structures at Carolina Beach, cinder-block construction became a popular substitute. Not only was it deemed more durable, but because of the war effort, more traditional building materials were in short supply. Over the years, the Lewis family has modified the Joy Lee Apartment Building several times to remain competitive with more modern buildings being constructed around it, including replacing bathroom showers with bathtubs in 1954, adding a lanai and portico in 1957, and an office and fireplaces in 1960. Major improvements in 1976 included enlarging the dining area with a bay addition, adding spiral cement stairs to the upper level sundeck, and installing an in-ground swimming pool. 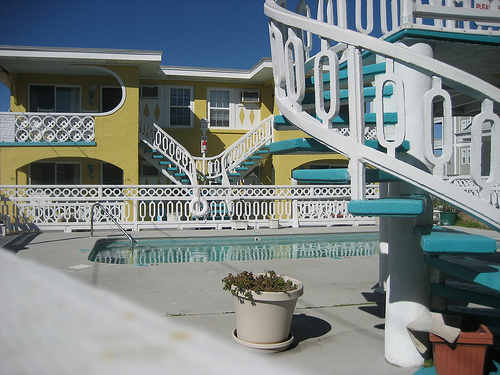 While the Town of Carolina Beach has replaced many of its earlier structures with contemporary hotels, motels, and cottages, the Joy Lee Apartments is an original, built from the imagination and ingenuity of a World War II shipyard worker. The solid construction of the Joy Lee should ensure its survival, while continuing to provide Carolina Beach visitors with a glimpse into the past.